The Cheswold Police Department received a report from a citizen that his daughter left their residence on Dayflower Ct in the Fox Pointe Development on Thursday morning to take a vehicle to a local repair shop and failed to return home. 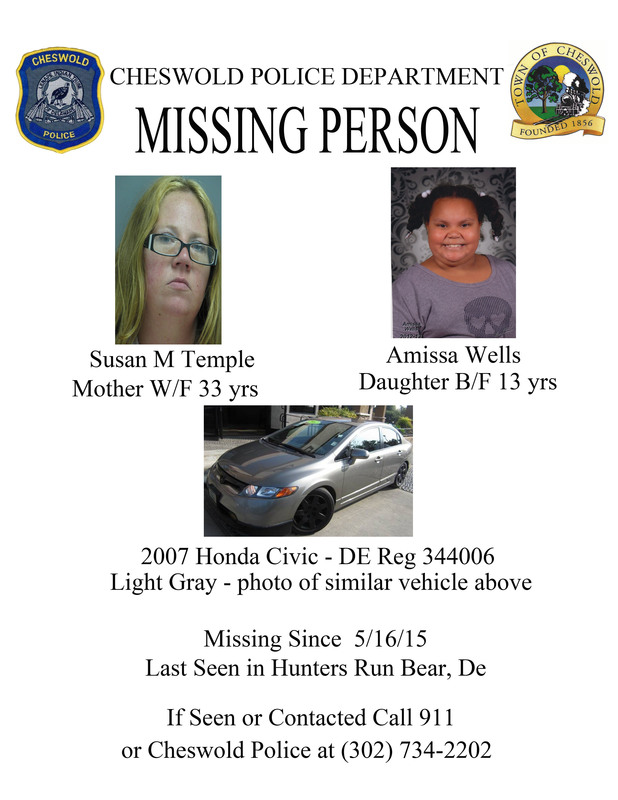 Susan Temple, 33 yr old W/F was reported to be last seen at her brothers residence the Hunters Run Development located in Bear, DE on Saturday, May 16th around 12pm, where she picked up her 13 yr old daughter, Amissa Wells. The father has made numerous attempts to contact Ms. Temple on her cell phone with negative results. Ms. Temple has custody of her child and is currently wanted on two capias’s’, at this time we believe that there is no foul play involved. If you know Ms. Temple or have seen her or her daughter Amissa please call 911 or contact the Cheswold Police Department.